Sometimes I feel people are so quick to follow the trends, that they don’t stop and actually think about the entire scenario. Now it’s hard enough for us to trust our government, but for people to actually trust others with their kids candies, snacks, and what ever else the anonymous hands out. 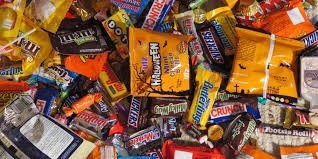 You know, pills, Extac, marijuana candies, expired snacks or candies, candy injected with sharp objects, candy that has been opened and closed again, candies or snacks that have been recalled, and last but not least, the possibility that everyone isn’t as friendly when you approach their door way. Now these are only my opinions but, I’am not a big fan of just knocking on people’s door with my child asking them for candy. I rather purchase all of the candy my child would want and take her to a haunted house or party or something. Make smart decisions for your kids this Halloween. They depend on you.